Ma'alefa'ak was absolutely ruthless, attacking from all directions. His body shapeshifted into blades and blunts. His eyes burned with Laser Vision. Parts turned immaterial, then solidified, rending muscle and cracking bone. 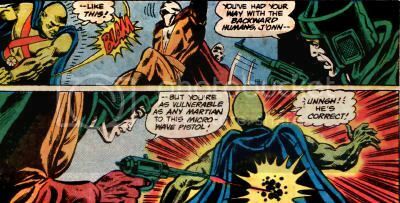 The Martian Manhunter would have never fought in this manner, without hesitation, even relishing the violence inflicted. 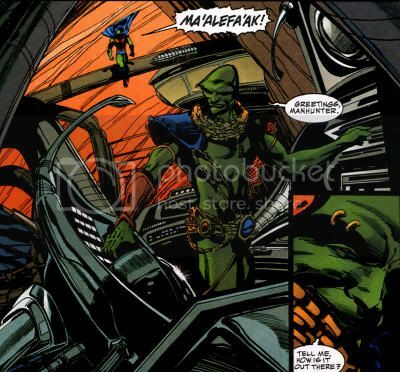 Still, "Malefic" lacked the full range of J'Onzz's powers, which have never proven a match to the Kalanorian since his rebirth in the Flame of Py'tar. 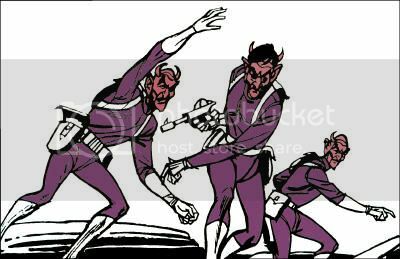 The Devil Men of Pluto had a fine run. They always do. They're unrepentantly evil, uncompromising even when individual members are threatened, and unwaveringly intent on their goal. Of course, so was their opposition, who had ravaged his own home world purely for personal gain. 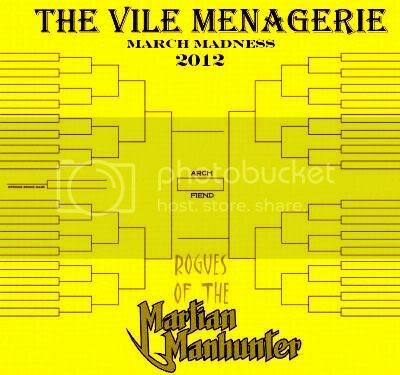 The Martian overpowered and outclassed them completely, beating and robbing them in barely any time at all. Commander Blanx had the teleportation sphere and a devious plan. He transported himself and one other back to the Iron City... at least, in part. 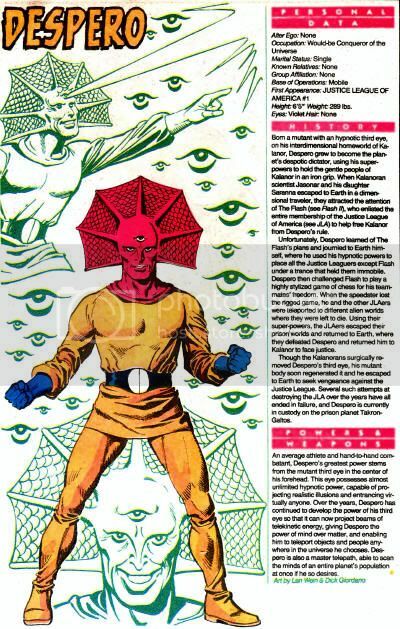 Despero's genetic make-up had been programmed into the sphere, but in his original form from earlier in his career. The Kalanorian was still a force to be reckoned with, and the Martian had even more limitations on his powers than the fallen brother of their mutual nemesis, J'onn J'onzz. 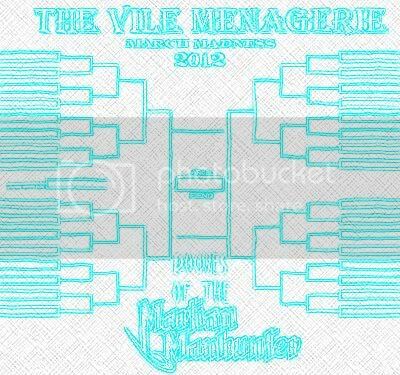 Who will be the ultimate victor? 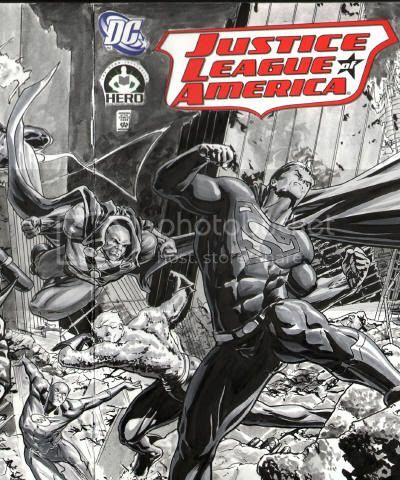 Patrick Scherberger is one of the most notable artists to flash up Marvel Comics' all-ages superhero titles, which might explain his anachronistic JLA. 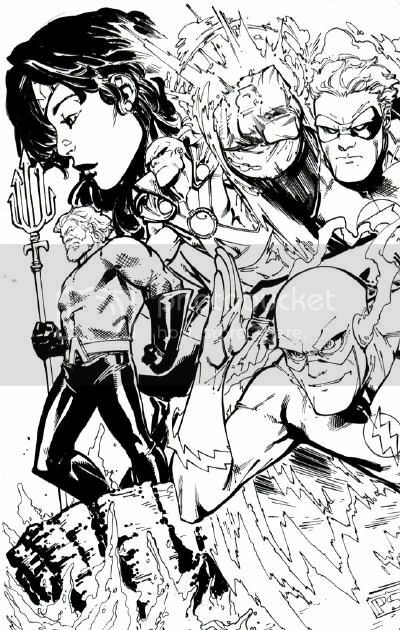 Superman, Batman, the Barry Flash, and Wonder Woman (that we can see of her) are on model, but then Hal Jordan shows up in his rookie Green Lantern costume. There's an otherwise classic Aquaman with a bushy beard, and then Brightest Day Martian Manhunter. It's anarchy, but forgivable because it looks so nice. My second greatest DC New 52 pet peeve* is that seven months in, we still haven't seen a Martian Manhunter design sketch, or even a credit to the artist responsible for the reworking. I actually like it and have generally positive things to say about it (for once,) but a year in, DC just keeps spitting up godawful Jim Lee costumes that are as out of touch as anything in Nightwing's closet. Anyway, I suspect blogger Jim Smash!!! had similar frustration over José Ladrönn's Martian Manhunter redesign following Infinite Crisis in 2006. Six years later, and I've yet to see any of Ladrönn's actual art for the project, with web searches triggering an echo effect back to this blog's previous requests to see said art. Al Barrionuevo's art on the mini-series that featured it favored squat, skinny panels and obscuring angles that rarely showcased the design clearly, and other artists tended to tweak the design in books as it suited them. 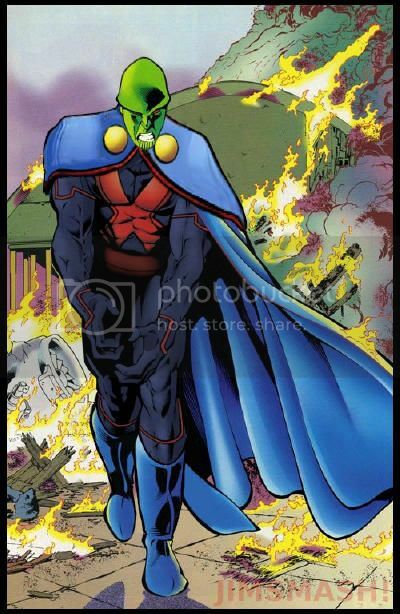 In 2008, Jim was driven to take one of my favorite Martian Manhunter images, a Jeff Johnson splash from 1996's Justice League: A Midsummer's Nightmare #2 and work it over in Photoshop with the "Coneheadhunter" suit. The result is pretty freakin' sweet, and I echo Jim's sentiment about how we should have gotten Johnson on a solo series after this! Say Jim-- you ever consider doing this again, DCnÜ stylee? *After "Why is Wonder Woman running around with a sword, chopping people up?" Then again, that's been a problem since before any of us ever heard of Dan Didio. This was originally for Comic Vine. People seemed to give the rough so I just had to finish it. 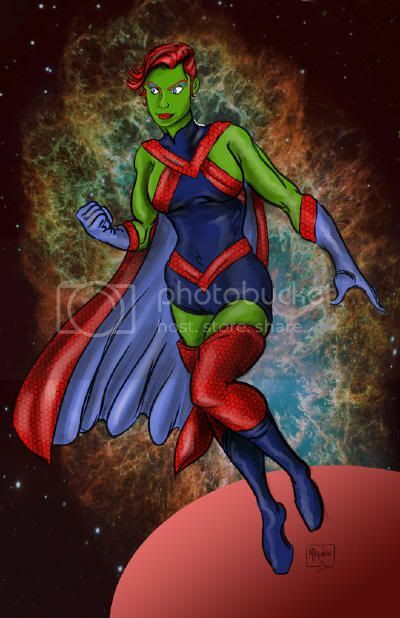 It's based on the Martian Manhunter redesign I created a while ago. It works well for a grown up version of the current character. Updated with a slightly less manish face and brighter colors. Aguilera also played with three alternate designs. 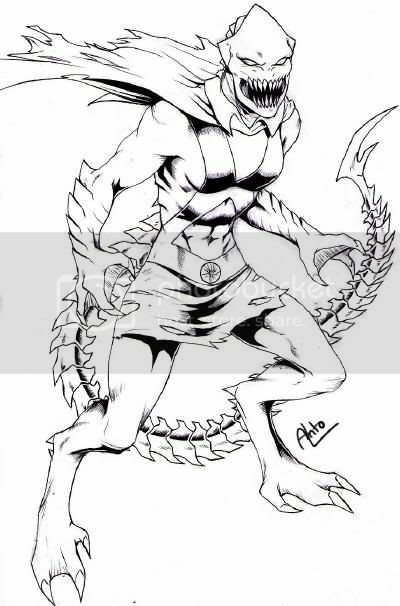 One was so radical, it fit the "Lizard-Beth Salamander" take I had in mind for the character during the McKeever days, before the Young Justice cartoon solidified her characterization as manga-sweet. There's a gladiator and Legion of Super-Heroes take too, which you can check out here! The wars were nearly over in the Iron City. 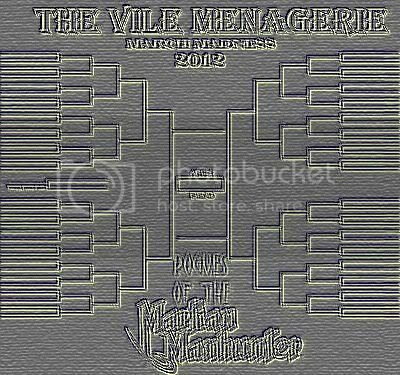 Its "boss," Mister V, had already been defeated. Professor Hugo had managed to capture Bette Noir's psychic self, but when he had the idea to weaponize this entity (as Dr. Trap had done once before,) it backfired on him. Bette latched onto Vandal Savage, whose centuries of immorality outstripped any horrors that she had ever known. The telepathic backlash impacted on Hugo's big brain, and all fell down. Mr. Moth was either skilled or blessed enough for his shot to ricochet off the side of the tank, then graze the invisible flesh on Mister Bones' noggin. When Bones slumped back through the port, his own gun misfired, triggering a blast from the tank. Striking a support for the overpass, the aging structure collapsed into the subway station underneath. This result was likely related to the vibrations of the Invaders from the Space Warp, once their rifles proved ineffective against the robot sentry. Ma'alefa'ak flew down from the volcanos to greet Darkseid. 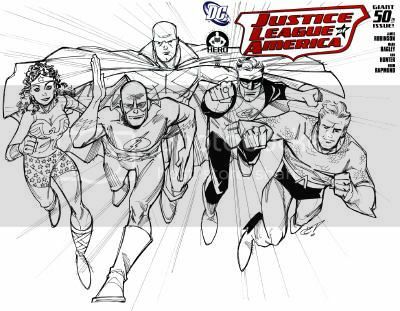 "You were once my master, oh Lord of Apokolips, but I am ever the iconoclast..."
The Silver Age Founding Five Justice League in the ginchy-good animated style! The Eye of the Storm, the headquarters of Stormwatch, went boom. Some of the debris was promised to hit Earth in an upcoming issue of Superman. Having left Hyperspace and entered the regular kind, military authorities became aware of the spaceship's presence. Jenny Quantum created a forcefield bubble around herself, the Engineer, Jack Hawksmoor and Martian Manhunter, the latter having established a telepathic link for communication. Midnighter was blown out into space, but was rescued by Apollo, who flew him back to Jenny's bubble. "God, you're hot." The Eye was large enough to qualify as a city, so Jack Hawksmoor made contact with its avatar, an irate Daemonite. " --You humans stole me-- bound me. And made me into a slave!" J'Onn J'Onzz maintained a mental rapport, and painfully acknowledged of the artificial intelligence consciousness, "He has woken it! Its psychic presence-- it is enormous!" It had been switched off since Stormwatch "stole" the station, and would "joyfully die" in service to the "holy cause" of killing these jerks. The Engineer somehow powered-up Jack's synapses, making his consciousness strong enough to rival the Daemonite's. Instead of a brawl, Jack convinced the intelligence to "repurpose the millions of tiny forcefields that keep the station running" to "haul it back together." As a reward, the Daemonite would not be shut down again, and would have opportunities to aid its people. "Worthless unbeliever. I shall be your "city"-- but remember, you are parasites to me." The Eye restored and in Hyperspace, Midnighter needed medical assistance, but demanded it for Jenny first. The Engineer wanted Harry Tanner's blood, as did Midnighter, who agreed to join Stormwatch with her as leader. As for Apollo, "Oh, if I join up-- he will too." J'Onn J'Onzz did not know how to contact the redubbed "Shadow Lords" with Adam One gone. "I presume the Projectionist would have been told, being our new leader. She might know now. Which is worrying. But it is the way things have been done for centuries." J'Onzz was stressed over his inability to decipher what the horn was, and the betrayal of Tanner. "I considered him a friend. This is what he used to kill us. The Projectionist, whom he took to hide himself and limit us-- I was starting to enjoy her company a great deal. She is a warrior. If she can, she will contact us." J'Onzz noted Apollo, "said I was 'with the Justice League'-- a shorthand for 'public hero' that many humans use. But I have never actually attempted to join them. Because then I would have to keep secrets from them-- because the part of my life in Stormwatch means I would have to betray them!" The U.S. military locked into the space sector where the Eye had appeared, intent on attacking it and taking its Hyperspace technology should the opportunity present itself again. A meeting was called. For the first time, Stormwatch was on its own, and put leadership to a vote. Jack abstained with a caveat about loyalty to Adam One, while J'Onzz would support the consensus in this time of crisis. Apollo, Midnighter and Jenny approved the Engineer's nomination of herself. Their new mission: Securing alien artifacts and other objects of power previously known only to Adam One, but now accessible to the Eminence of Blades for his own plans. "To find them, we're going to need to become... explorers of what might have been." "The Dark Side: Finale" was by Paul Cornell and Miguel Sepulveda. Talk about ending with a whimper. It was also something how all the forward momentum of an already limp plot petered out halfway through the issue, so that readers were treated to whole pages of random army guys at computers talking over coffee. It's such a treat to see Jack Hawksmoor look at grid coordinates for another full page. Yeah, you super heroes sit at that conference table like you really mean it. The dual explosions of Brimstone and Fernus nearly shattered the island itself. Caught inside a maelstrom, Doomsday sensed something familiar within his atavistic brain. "Apo-ko-lips..." Through the flames, he spied a figure whose dimensions were nearly as impressive as his own. Twin beams of red cut through the inferno, as Darkseid pronounced, "Come then. You are not what you once were, and I will ever be your master..."
The Brightest Day cabochon and the JMS Wonder Woman make appearances on this painterly (but penciled) piece. The Falcon's plane had struck something in the air, and though Porto's falling form went unnoticed, enough damage was done to require an immediate landing. Falcon luckily spotted a landing strip where military vehicles were located. Upon landing, the Falcon spotted a uniformed figure lying near a tank, a purple-clad General. Concerned, he turned to scan the area, and found himself face-to-skull with Mister Bones. Before we even get started on the books, what the hell is this? 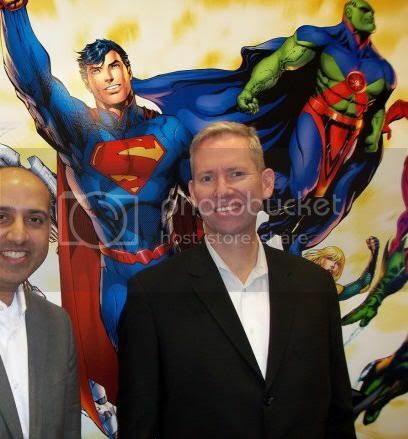 There was a party to celebrate the unveiling of the latest DC Entertainment logo a couple of months ago, but I never noticed the enormous mural featuring New 52 versions of DC heroes, including a heretofore unseen Martian Manhunter that appears to be from the pen of Patrick Gleason. You can see more of it at Co.CREATE, and if someone out there could direct me to the full piece, I'd appreciate it. Let me get this straight: The new writer of Stormwatch starts his run with the first part of a story that crosses over into a better selling title he launched that just lost its hot artist, who is being replaced by the former artist of Stormwatch that was helping to buoy its sales. Is this mean to broaden Stormwatch's audience or cannibalize it? Also, I don't really want to read about the Red Lanterns at all ever. Frig. I haven't received the new issue yet, but I'm seeing and hearing good things. Maybe a completely new creative team will leave us with a book closer to what many of us hoped for in the beginning. At least the covers have gone back to including Martian Manhunter as part of a core trinity (for now.) I'm surprised they're going back to the Harry Tanner well so soon, though. This one's got "Rock of Ages," the Prometheus two-(3?) parter, and an amusing (then) intercompany crossover. J'Onn's got his moments here. I'm really not comfortable with the way DC seems to be assigning writers full authorial credit with that meek little art credit for the guys who do the heavy lifting. B'rett is one of my favorite, and trickiest, rogues to cast. As I've mentioned in the past, he's basically an old west rowdy. B'rett rolls into town, busts stuff up, talks crap, steals, and waves his pistol around. Then, the first true opposition he faces, the guy feigns friendship and plots a swift, sneaky demise. Jack Palance was great at that kind of thing back in the day, so I wanted a contemporary equivalent. I've been trying to cast younger for my 2012 list, but J'Onn J'Onzz and his foes just don't fit the PYT mainstream one would expect from a more popular property. My first choice, who made it all the way to an unpublished write-up with picture back in July of last year, was Michael Rooker. The Henry: Portrait of a Serial Killer star is in his mid-50s, and I'd voice cast him in a heartbeat for animation. He's still got a physical presence, based on his turn as Merle Dixon on The Walking Dead, but I'd rather not place a short shelf life on a casting decision. As an alternative, I considered Adam Baldwin, who's been playing this type of rawhide sumbch for decades, most memorable as Jayne on Firefly. The thing is, he's too classically handsome for B'rett, plus Baldwin just turned fifty his own self. Thankfully, in the time between my initial casting thoughts and finally publishing, Rooker's castmate Jon Bernthal took the character of Shane Walsh to a whole 'nother level on The Walking Dead. 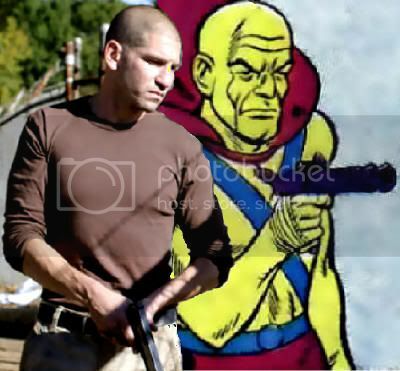 Between his shaved head, solid build and jacked-up nose, Bernthal became the spitting image of B'rett. When you break it down, Dead is an undercover western, as pilgrims make their way through a savage land with danger on all sides and justice delivered out the barrel of a gun. Shane's brutal, conscienceless pragmatism, clumsy manipulations, and base motivations in season two are exactly the sort of thing I'd expect from our favorite xanthic bandit. Tell me I'm wrong! S'vor's momentary indecision cost him dearly, as he was struck from behind by Ryx's battered unconscious body, and both were flung into the deadly drink. The impact caught Scorch's attention as a similarly red-hued figure jogged toward her smiling. Wading into the silvery pools of melted metal, The Saturnian Criminal asked her, "Slide over here, and give me a moment. Your moves are so raw, and you look like one of my kind..."
M'gann M'orzz is a little ticked that she hasn't gotten her Miss Martian Monday in a while. 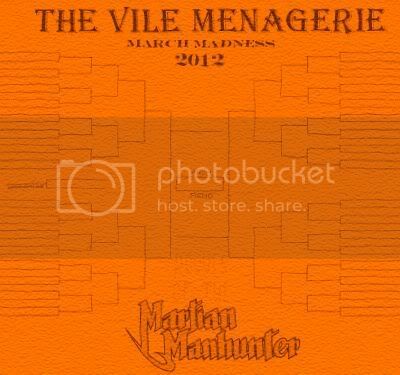 In the spirit of Martian Manhunter Menagerie March Madness, here she is in her scary natural White Martian form! Geoff Johns: "Martian Manhunter gets really messed up in this whole movie, doesn't he?" Mike Carlin: "Yep, they're really kind of mean to him... But he can take it. What I like about him in this movie is they actually make him really cool, uh, and very different than Superman. In the comics a lot he's kind of like Superman but he can be invisible. Uh, so he's got one more power than Superman. But here he's..."
Geoff Johns: "He's very alien, and one of the great things, I think, about this animated feature compared to some of the others of the Justice League is that we get a really great glimpse at their personal lives... And even Martian Manhunter's, who you don't really... see often..."
Mike Carlin: "You don't know a lot about him." Geoff Johns: "We were actually talking to Dwayne (McDuffie) about writing a Martian Manhunter comic book before he passed away." Mike Carlin: "Oh, that would've been cool." Mike Carlin: "I did not know that... You can always learn something on these commentaries." Geoff Johns: "I thought this was an interesting group..."
Mike Carlin: "...Not the usual Legion of Doom... It's got a lot of the newer takes on characters, which is great." Geoff Johns: "...This character right here (Malefic)"
Mike Carlin: "First time in a cartoon." Geoff Johns: "Created by John Ostrander and Tom Mandrake for the Martian Manhunter series, I believe." Mike Carlin: "I like they figured out the pronunciation of that for us." Geoff Johns: "I think it shows the... psychological profile of this villain here... this is how they decide to get at John... So there's obviously some kind of hatred and love... battling there." Mike Carlin: "The last two survivors of the Martian community." Mike Carlin: "Oh, this is really interesting." Geoff Johns: "We had talked about, uh, Martian Manhunter. Detective, uh... John Jones... and uh, the really cool... seeing a scene with him." Mike Carlin: "Yeah, you don't see the private life of Martian Manhunter... at all in Justice League comics." Geoff Johns: "And it's very different from Clark Kent or anyone else because..."
Mike Carlin: "Yeah, he's not the rich guy." Geoff Johns: "Well he's just... he's alien. You can see it..."
Mike Carlin: "He doesn't know how to act with people." Geoff Johns: "Yeah, it's just a brilliant take. Like... I'm not sure that the books have ever really captured on that, because even in the short lived little series he had in the nineties..."
Mike Carlin: "Ostrander had a cool take on the Manhunter, but it also kept him from becoming completely human like Superman has. Uh, Superman has really integrated himself as a human in human society. And Martian Manhunter had not just one secret identity but thousands all around the world. Which is a cool idea, but you don't get settled in that way. And you certainly don't learn how to, uh, interact." Geoff Johns: "One thing I love about this scene is that it shows that, you know, obviously the League's been together for quite a while here. But, he's still not acclimated to our world... and I think that definitely does separate him from Clark Kent and Superman, who grew up here. But it also does make him unique... because you know he does have similar powers to Superman and..."
Mike Carlin: "...He gives a different flavor to this, uh, mix... which is great." Geoff Johns: "Now, he was a member of the Justice League a lot when you were overseeing editorial, right?" Mike Carlin: "Yeah, there was a point where Martian Manhunter was the only member of every incarnation of the Justice League. I don't know if that's true anymore." Mike Carlin: "...It took him long enough. He got his own comic. Then he doesn't have to be in the Justice League anymore. Geoff Johns: "He'll be back, though." Mike Carlin: "Yeah, cause Martian Manhunter had very few if any villains of his own. He was always just a Justice League guy. 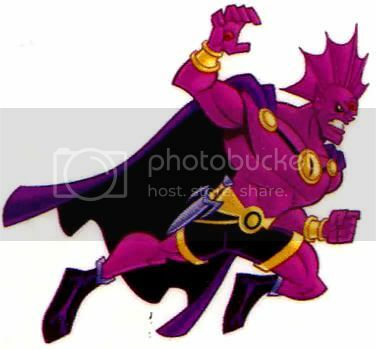 Geoff Johns: "Well, when you don't have your own series... How many villains does Aquaman have?" Johns later notes that people clamor for the Martian Manhunter to be in the League because he is more clearly alien than anyone else, including Superman, making him unique. Carlin likes the cool gross creepiness of his shapeshifting powers. 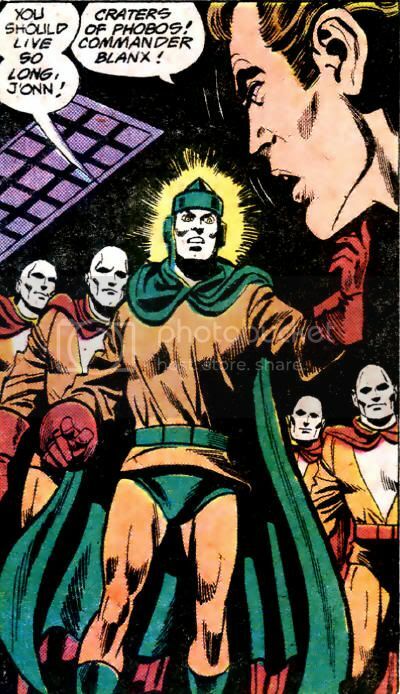 Johns also enjoys the shapeshifting battle between Manhunter and Malefic, especially the Starro cameo. King Zeus wasn't used to working without minions, but he possessed the tools and determination to make this city a new domain for his collection. However, having worked his way up a twisted xenomorph skyscraper, he had found the immortal Vandal Savage lying in wait. He was a mere caveman, so what concern was he to a god...? Lady luck always favored Professor Amos Fortune, at least if he had anything to say about it. He had brought along a probability adjustor for insurance, and he'd need it against medieval villain Baron Voto, whose magical ring had previously won him the European nation of Lavonia. The man lived in a castle, and doesn't the house always win? Base of Operations: A deserted marshland outside Middletown, U.S.A. The mysterious General, through unrevealed means, hand-picked a troop of men and outfitted them to act as a unique criminal military force. Employing weapons smuggled into the country, the plundering platoon organized itself along military lines for profit. The little criminal corps' first recorded heist involved robbing a vault with the aid of a tank. The crime force next looted the payroll of Apex Paint, but the crook-soldiers involved were arrested with the covert assistance of the Manhunter from Mars. 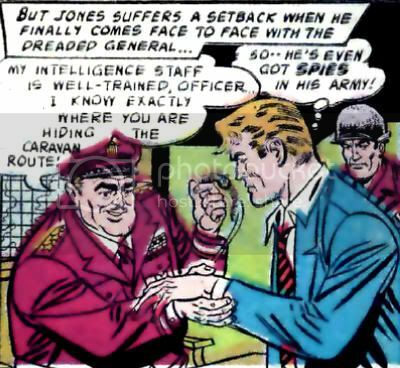 The General had many other highly trained units, allowing his uniformed gangmen to besiege Middletown, U.S.A.
A trap was laid by the local police force, setting up Detective John Jones as bait, but spies allowed Jones to be captured without concern. However, the Manhunter from Mars could not be contained, and invisibly blitzed the crime-corps during a brazen daytime robbery. Despite their weaponry, the crime army was no match for the Martian Manhunter, and was taken into custody. The General displayed no exceptional physical attributes, and relied on a lieutenant for much of his work. The General commanded dozens of troops armed with the latest military weapons of their day. The criminal corps' arsenal included machine guns, grenades, smoke shells, flamethrowers, several tanks, and a fighter jet. Quote: "We waged a good battle today, gentlemen, but we must strike again, swiftly, before enemy troops-- the police-- have a chance to counter-attack!"